The adverse weather may have brought parts of the UK to a standstill, but it has provided plenty of stories for the regional press, with many opting to splash on the snow today. 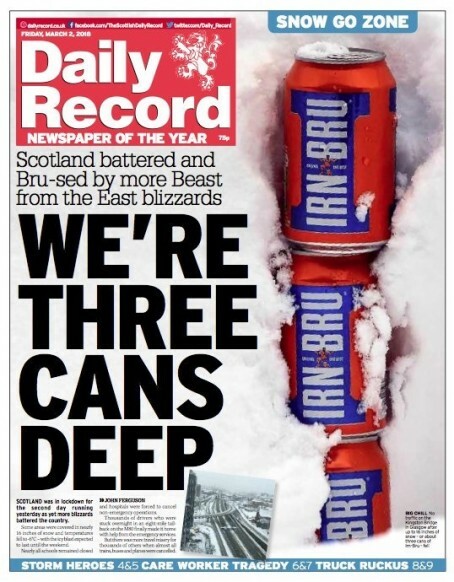 Scotland’s Daily Record perhaps topped the league table for sheer creativity, after the newspaper found an unusual way to convey the depth of the snow to readers. The Glasgow-based daily’s front page shows three stacked tins of Irn-Bru – often described as “Scotland’s other national drink” – to measure the fall. Whether the unit of measurement will be adopted elsewhere remains to be seen. In North-East England, the weather conditions provided an opportunity for three regional dailies to highlight an ongoing campaign. 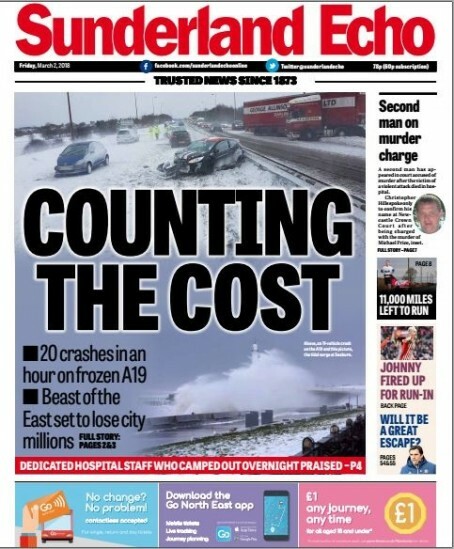 The Sunderland Echo, which is currently campaigning for better road safety measures on the A19, reported on a total of 20 crashes on the route in the space of just one hour. In September, the Echo along with its Johnston Press sister dailies the Hartlepool Mail and Shields Gazette, called for the Department of Transport to hold an inquiry into the safety of the road. 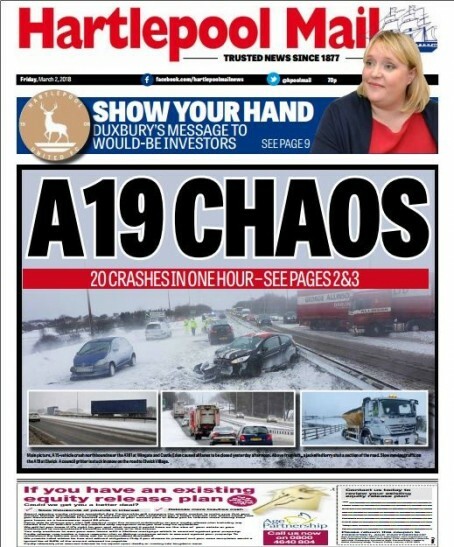 The Mail also chose to highlight the A19 chaos with its splash today. 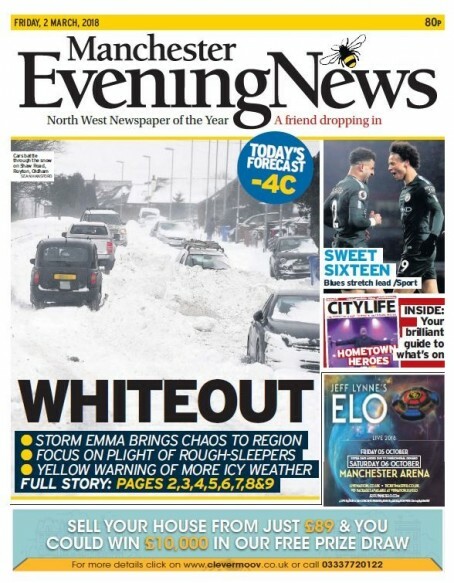 Travel disruption was also a theme found on the front page of the Manchester Evening News. The MEN’s photo showed cars in Oldham seemingly buried under the snow. 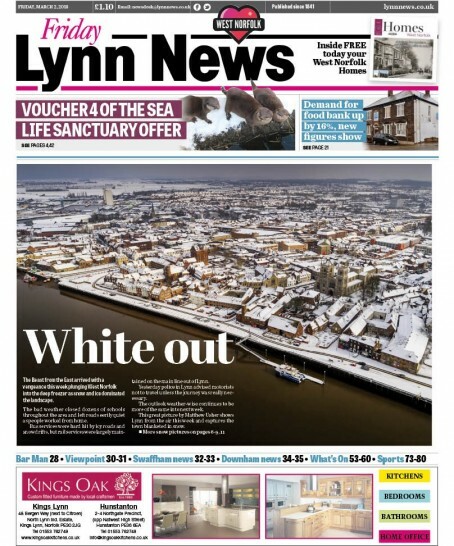 Striking a lighter tone, Norfolk bi-weekly the Lynn News provided readers with an aerial view of its patch under a blanket of white. More pictures of the weather were found inside the newspaper. And it was just the British mainland affected by Storm Emma. 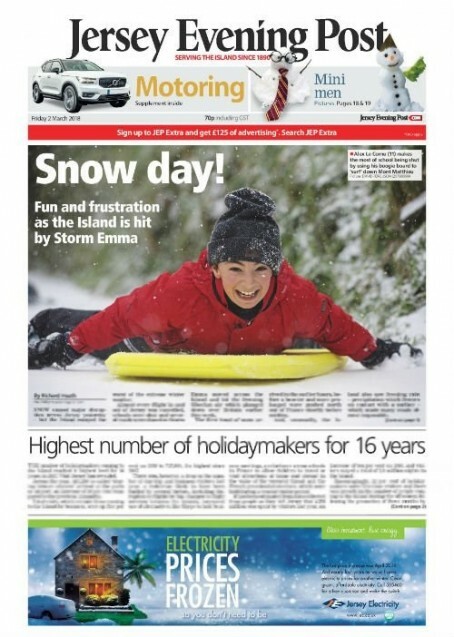 The Jersey Evening Post, which covers an island just 19 miles from the French coast, was able to provide a photo of snow-related fun on its front page today too. Easy splashes. Nil point for originality, but when you are short of hacks snow pix are good standby. Wonder how many free cans of Iron bru have made their way to the Daily Record office? Terrible commercialisation of the front page, it might as well have ‘advertiser’s announcement’ across the top of it. Tick boxes for next snow story. top 10 tips. 1. Forecast warns everyone of heavy snow. 3. Flights and trains get delayed. 4. Outlying villages get cut off as they always do. 6. Hospitals have more accident victims. 7 Dumb drivers rescued after taking stupid risks. 8 Find a “Wonderful community spirit” story. 10.Wait for the thaw floods. whoops. Forecast should not have a 1. beside it. I can count but my fingers cannot.